1/19/2012 - Today's cards are a direct follow up from yesterday's discussion of Runeward Bear. Wobbles had suggested moving the ability that helps prevent the aura-problem to the aura itself. Rather than put split second on the aura, he used the bear's hexproof-while-targeted ability, which I prefer because it's the least disturbance that achieves our goal. Next, Chah helped pare down the reminder text to something reasonable. There are a few ways this could look. 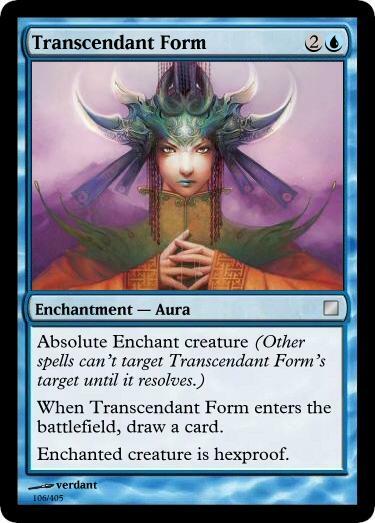 First, it could be an additive keyword on the aura. It's pretty clear how this works; it prevents your opponent from killing the creature with your spell on the stack and thus negating both for one card; and it's pretty neat that you could reuse this keyword on sorceries and instants too. Here's an example protective instant and a harder-to-avoid removal spell. 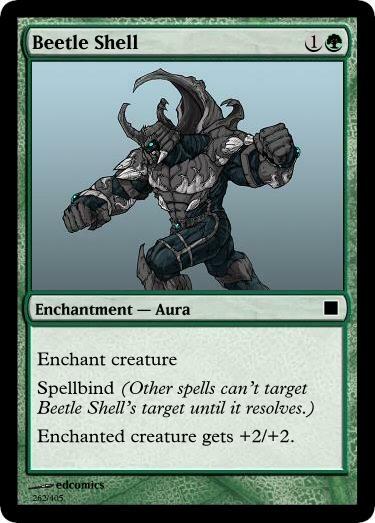 The original suggestion was to replace "Enchant ~" with "Spellbind ~" which I'm fond of because it saves a line of text but also because it hints that there are different ways for an aura to enchant a creature. I did want to use the word 'enchant' as part of the new keyword so that it's clear that it has the same basic function (causing you to choose a target of a certain type). As for which keyword to use, I'd like your input. I've got three suggestions here. 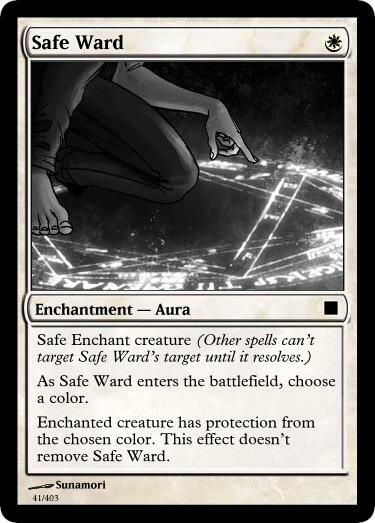 "Safe Enchant ~" isn't perfect because it's not clear what's safe, the aura or the target or what, but it's a fair starting point. "Inevitable Enchant ~" is cute, suggesting that there's nothing your opponent can do to stop it from resolving (short of countering the aura itself, which I believe is an important interaction to preserve). Similar here, but with a more imperious tone than ominous. All of these example auras are designed to benefit from this spellbind upgrade by either granting the creature some additional resistance to future removal or by doing something when they enter the battlefield, so that you're practically guaranteed to reap some benefit from casting the aura in the first place. Do you prefer the additive keyword or the replacement keyword? I'm torn between the two methods because of the greater flexibility of the additive keyword and the brevity of the replacement keyword. Which of the replacement keywords do you prefer? Can you find a better one? There are a few problems with that reminder text. First, it doesn't prevent targeting from abilities. That's pretty funky considering everything else that prevents targeting prevents ALL targeting. Second, "until it resolves" doesn't actually work. If the spell gets countered, the end of the ability never happens. This means that the creature is "enchanted" while the spell is on the stack, but the spell still resolves as normal. It can be countered, time stopped, etc. This wording avoids all the hexproof weirdness and just gives the creature the buff automatically. Ohhh, that works better and less intuitively than I thought. I was reading exigent as the spell resolving as soon as you cast it. But you're saying the spell is still on the stack, just that it begins affecting the targeted creature immediately. That's a clever solution, but probably too clever. It's just very rules-weird and not at all obvious. For anyone that missed the comments that led to the current reminder text for spellbound, we were looking for something as short as possible that doesn't reference the stack, but Duncan has found two flaws with it. 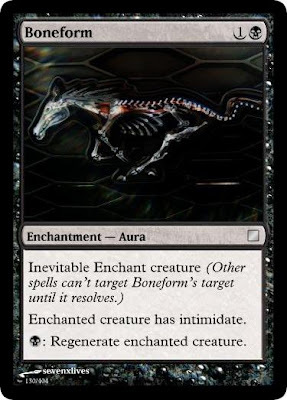 "Targeted creature has hexproof as long as CARDNAME is a spell?" I like the additive keyword better because it can go on other card types as well. Stop being mean to poor Tallowisp! 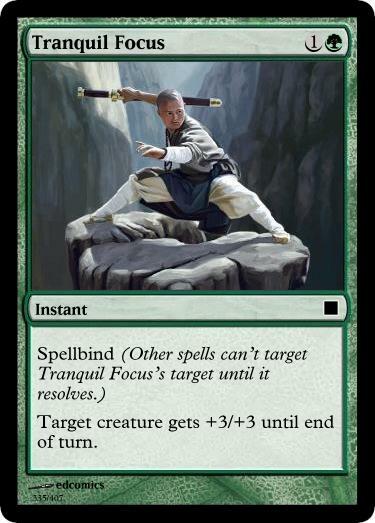 This wording avoids that icky word "resolves" and makes it clear that spellbind stops applying when the Aura hits the battlefield (and is no longer either a spell or targeting anything). 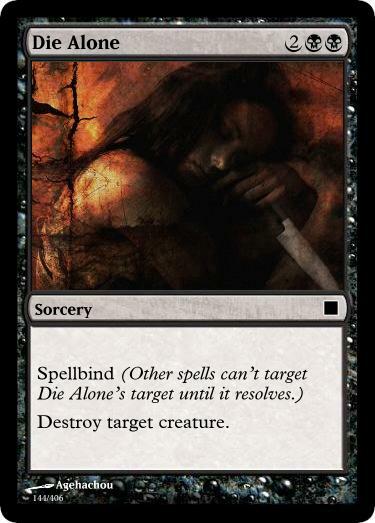 I think Jenesis' solution for spellbind is the best. Also, I prefer the additive approach instead of the replacemnt, for two main reasons: it opens up more space design in that you can use it on other types of spells; it is more simple and intuitive for beginners that there is one and only way to normally attach an aura to something. I recommend just using goblinartisans as your URL, at that point. Linking the host is a recursive way to preserve a certain amount of anonymity while giving a nominal identity, right? The setting for who can comment is currently as open as it gets for Blogger, so if you're unable to take advantage of any of the current methods to provide a more unique identity, there isn't anything we can do. Evangelize isn't an instant. If it were, I believe this wording would prevent them from choosing the spellbind target as the Evangelize target. I hope Pasteur's advice works for you, Jenesis. If not, you can make a Google/Blogger account without a blog and with very very little information.